This product has been discontinued by the manufacturer, or is no longer available through ArtSuppliesOnline.com. We apologize for any inconvenience. 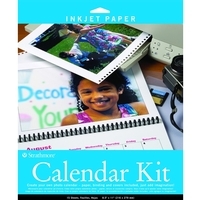 Create your own photo album using your digital photographs. A great keepsake or the perfect gift for family or friends. Kit contains album cover and back, 15 sheets of 2-sided digital photo paper, clear overlay and our easy click binding mechanism.